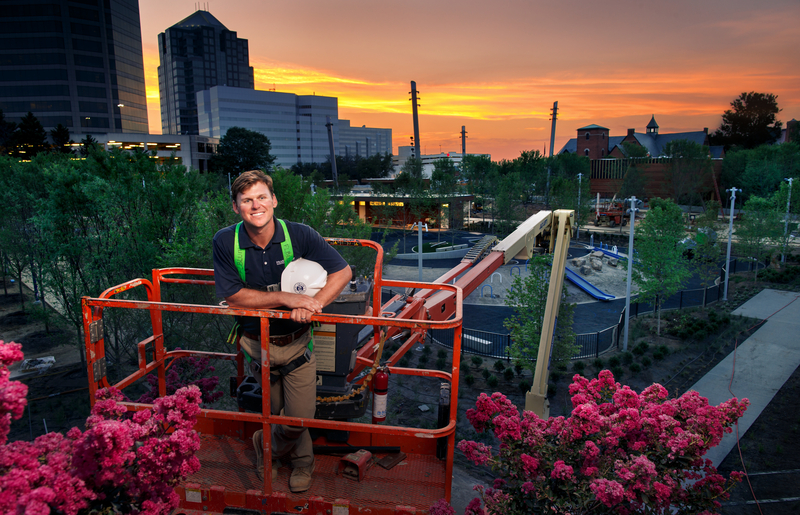 Josh Cook, 32, has been dabbling in construction since he was a teenager, including lending his father a hand in building the Greensboro Children’s Museum. 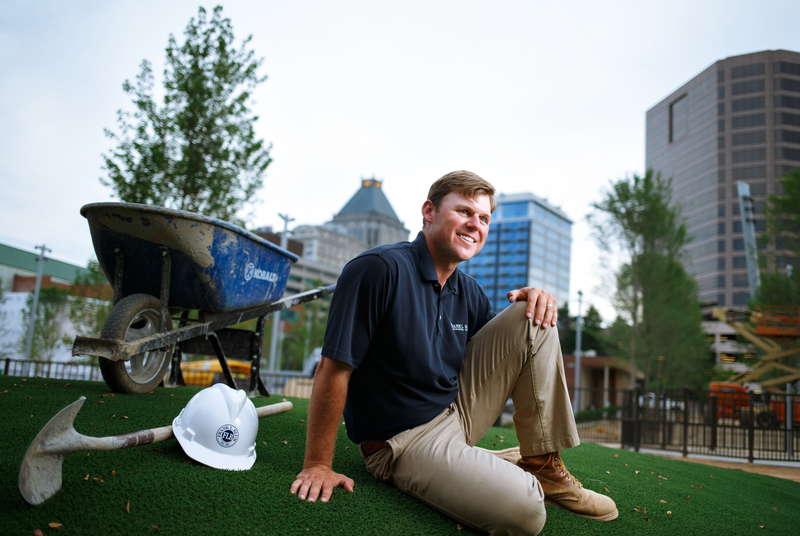 Now, as a project superintendent at Frank L. Blum Construction Company, he is overseeing the construction of the new 3.3-acre LeBauer Park in downtown Greensboro, which is set to open August 8. Josh leads a five-person team that is responsible for managing a larger team of 20 subcontractors and ensuring that the $10 million LeBauer Park is satisfactorily completed. “We build the schedules, manage the labor and the budgets, and ultimately, we manage the quality of the construction,” he says. LeBauer Park is the centerpiece of nearly $300 million being invested into revitalizing downtown Greensboro and its surrounding areas. The park is made possible by a generous gift from notable Greensboro resident, Carolyn LeBauer. The Community Foundation of Greater Greensboro will present the park to the city upon completion. Josh is optimistic that not only will the park benefit current residents, but it will also draw people to the city. “There is absolutely nothing like it anywhere around,” he says. LeBauer Park will feature a first-of-its kind public art piece – a play-space sculpture designed to engage children with sensory processing disorders like autism and an aerial art installation by globally renowned sculptor Janet Echelman. Two Greensboro favorites, Noma Food & Co. and Ghassan’s Restaurant, will have on-site dining facilities. There will also be an interactive fountain, a dog park and a putting green inside the park. 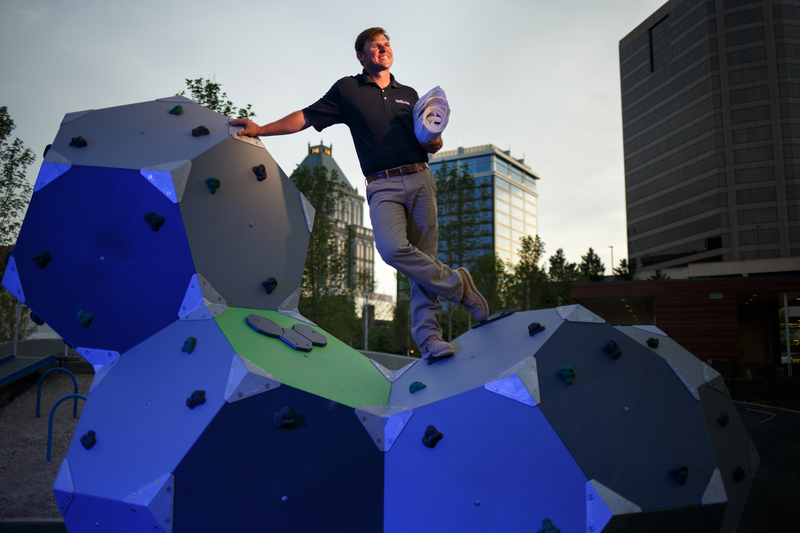 This is the first park Josh has built in his nine-year career with Blum Construction. “It’s challenging, so it’s a good project to cut my teeth on and I love that,” he says. Josh is even more excited that he finally has a chance to work on a project that his five-year-old son and two-year-old daughter can appreciate.